Obituary – Morgan, Debra Jean « Perry High School Alumni Association, Inc.
F. H. A. 65-66; Christmas Vespers 66-67; Girls’ Chorus 66-68; All-School Revue 66-68; Home Ec. Style Show 65-66. Joint services will be a 2 p.m. Thursday at the First Christian church for Mrs. Howard C (Grace) Morgan, 48, and her daughter, Debra Jean, 20, both of 300 Birch street. Burial will be in Grace Hill cemetery under the direction of the Parker funeral home. Mrs. Morgan and Debra died of injuries received at 11:30 a.m. Tuesday in a head-on automobile collision 8.5 miles west of Stillwater on state highway 51. Mrs. Morgan was dead upon arrival at Stillwater Municipal hospital. Debra Jean died at the hospital about an hour after the accident. The same accident also took the life of Michael Dennis Clark, 18, Sherman, Texas, driver of the other automobile in the crash. His passenger, Eileen Frances Luther, 17, Sherman, Texas, remained in critical condition Wednesday at Stillwater Municipal hospital. Trooper Robert Glandon, of a Stillwater highway patrol unit, investigated the accident with assistance from Lt. Ronald Gene Knox, who is stationed in Perry. Trooper Glandon said Mrs. Morgan had been driving west on state highway 51 in a 1966 F-85 Oldsmobile four-door. Clark had been driving east in a 1968 Dodge Dart four-door. Mrs. Morgan’s automobile went off the edge of the roadway on the north side. It swerved back to the south into the path of the oncoming Clark vehicle, Trooper Glandon said. The vehicles crashed nearly head-on about two feet north of the south edge of the highway, he said. After colliding, the cars bounced back only about a foot and a half. Both automobiles were completely demolished in the crash. Trooper Glandon said indications were at least some of the occupants were not wearing their seat belts. Mrs. Morgan and Debra had been returning home from Stillwater, where Debra enrolled Tuesday as a sophomore at Oklahoma State university. Tuesday was Debra’s 20th birthday. Mrs. Morgan was born Jan. 31, 1922, at Osage, Okla. She was married Dec. 24, 1940, to Howard C. Morgan, who survives. She and her family came to Perry in 1951. She was a member of the Christian church. Survivors include her husband of the home; one daughter, Mrs. Glenwood Groom Jr., of Perry; her mother, Mrs. Coy O’Rear of Pawhuska; and a sister, Mrs. Sturl Sheff of Compton, Calif; and two grandchildren. Miss Morgan was born Aug. 18, 1950, at Shawnee. She came to Perry in 1951 with her parents. 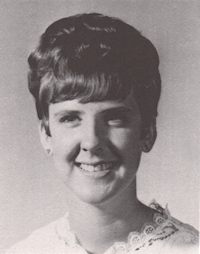 She was a 1968 graduate of Perry high school and was enrolled at OSU. She was a member of the Christian church and had been employed at the watershed protection office of soil conservation service. The survivors include her father, Howard, Morgan, of the home; a sister, Mrs. Glenwood Groom Jr., of Perry; her paternal grandmother, Mrs. F. C. Frazier of Perry; and her maternal grandmother, Mrs. Coy O’Rear of Pawhuska.